Sauza Tequila Import Company is a producer of tequila located in Tequila, a municipality of the state of Jalisco, Mexico. Sauza Tequila Import Company is owned by Beam Inc., headquartered in Chicago. Their products include: Sauza, Conmemorativo, Hornitos, Tres Generaciones. 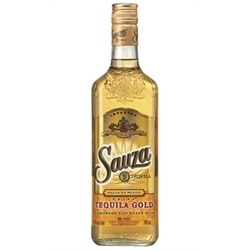 Despite the brand being bought by Fortune Brands on July 26, 2005, which spun off various other product lines, Sauza tequila products are still distilled at La Perseverancia. Slightly sweeter than a blanco tequila and outshines any other gold tequila. Color~Warm gold. Aroma~ Sweet caramel vanilla, with soft oakiness, light agave and pepper notes producing a soft roundness. Body~ Smooth and round. Taste~ Mildly sweet with fresh cut, balanced with white pepper. Finish~A soft medium long finish, slightly sweet but finishing clean. Award~ Silver Medal-2003 San Francisco World Spirits Competition. Not for agave purists? Perhaps. But it's cheap and...well, it's cheap!